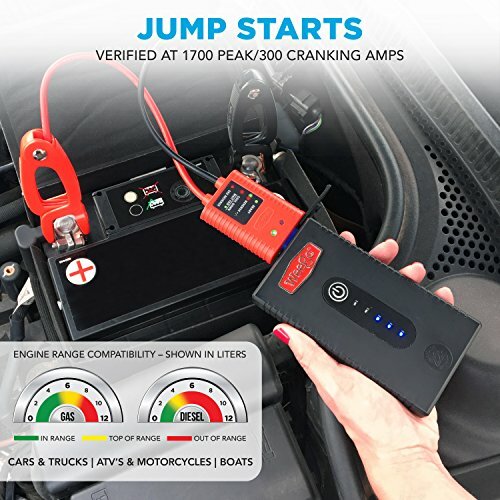 Weego is the safest, easiest and most reliable portable lithium ion jump starter for cars, trucks, boats, motorcycles, ATV/UTVs, and more. Weego 22s, our most affordable high-performance model, quickly and easily jump starts 5L gas and 2.5L diesel engines. Why so affordable? We’ve stripped away all the extras from our other models to serve one purpose only: jump starting for 95% of what’s on the road today. The 22s is guaranteed to provide power - 1700 peak amps and 300 cranking amps - when you need it most. Our power output measures are verified and independently lab tested so you know that you are getting what you paid for. 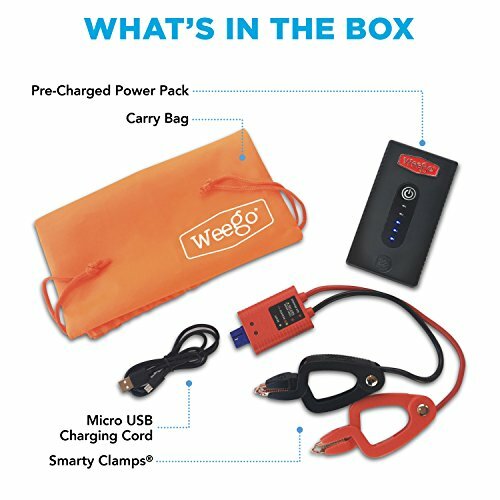 Weego Jump Starter 22s was designed and engineered in the USA for safe, simple and worry-free operation for everyone. 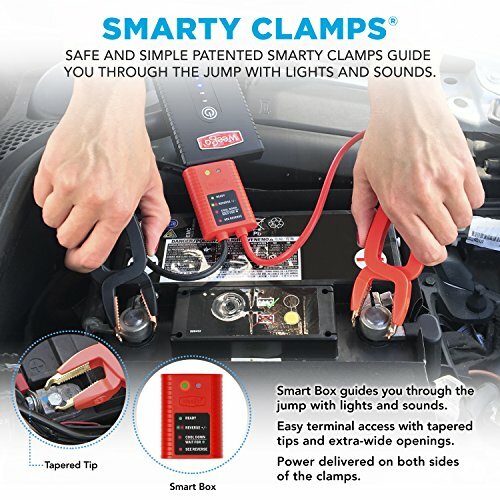 Patented Smarty Clamps ensure you can’t make a mistake. Lights and sounds walk you through a successful jump start every time. The ergonomic clamps have an extra-wide-opening, tapered tips and are powered on both sides, ensuring the best connections possible. Full safety protections are built in, including anti-spark protection, reverse polarity, over-heat and power surge protections. Best of all, a minimal 2.5-hour charge gets up to 1-year of standby power! Independent lab certifications and continuous testing ensures consistent, superior quality. Weego is backed by a crazy-long 18-month warranty from a company that's been in business over 50 years. And provides exceptional, dedicated, USA-based customer support. INCLUDES: Pre-Charged Battery Pack, Smarty Clamps, Micro USB Charging Cord, Carry Bag. JUMP STARTS ENGINES 5L GAS AND 2.5L DIESEL quickly and easily. 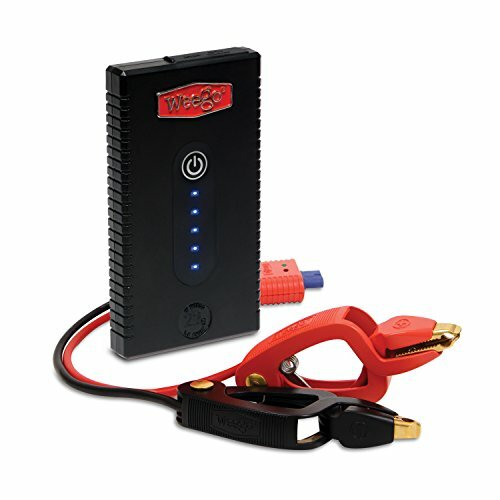 THE PROFESSIONAL'S CHOICE Only Weego High Performance jump starters are Designed and Engineered in the USA and proven to provide power when you need it most. Don't be fooled by other brands who over promise and under deliver with fake claims and reviews. The best choice when all you need is jump starting! 1700 PEAK AMPS and 300 TRUE CRANKING AMPS, GUARANTEED. We represent the power output of both measures to allow for an easy comparison across the marketplace. As with all Weego power products, our power outputs are internally and independently lab tested to verify results so that our customers can be assured they're getting what they paid for. UP TO 1 YEAR STANDBY POWER on a single charge and 1000 charging cycles. 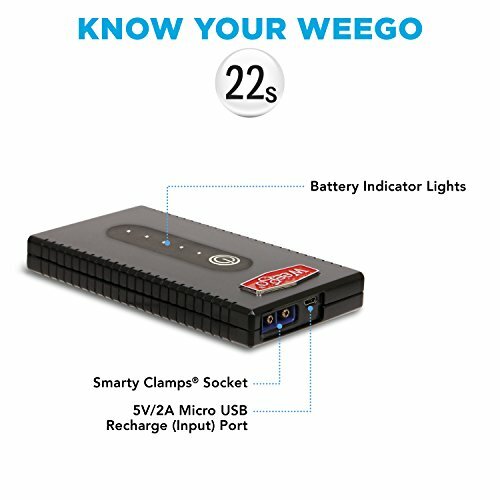 Weego 22s effortlessly Jump Starts cars, trucks, boats, motorcycles, lawn mowers, ATV/UTVs, & more with its high performance Long-lasting 12V lithium-ion battery. It's ready when you need it! SUPER SAFE COMPACT DESIGN ensures you cannot make a mistake. Weego's patented, Spark-Proof, ergonomic Smarty Clamps quickly walk you through the jump with lights and sounds. With tapered tips to fit into tight spaces and power delivered to both sides, our clamps are designed to ensure the best connection possible. 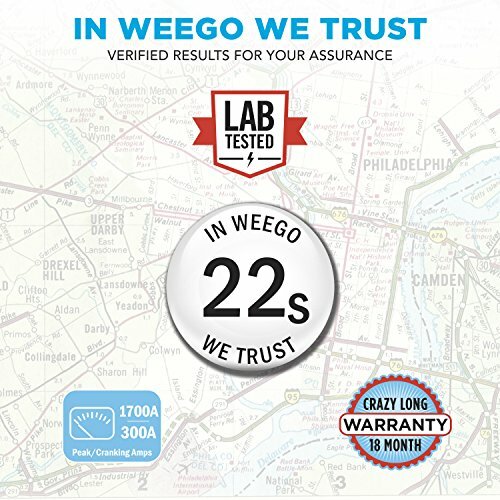 WEEGO DELIVERS SUPERIOR QUALITY, backed by our crazy long 18-month warranty. Exceptional Customer Service based in our home turf of Westampton, NJ means you never have to worry about being left in the lurch. If something is wrong, we'll make it right, we guarantee it! WEEGO IS THE PROFESSIONAL EDITOR'S PICK of the NY Times, LA Times, Popular Mechanics, Real Simple and many more! If you have any questions about this product by Weego, contact us by completing and submitting the form below. If you are looking for a specif part number, please include it with your message.